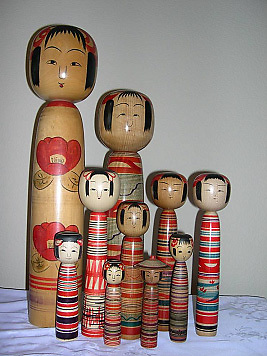 Tsuchiyu dolls are easily identified by their long, tubular, round shouldered shape and especially by the striped pattern on their body. The heads have a “bull’s eye” circular pattern. This will be explained later. The largest doll in the photo is the only one with two camellias on it , since usually there is only one. The dollmaker said that this was the only one he made with two on it. How lucky I was to have found such a rare doll!